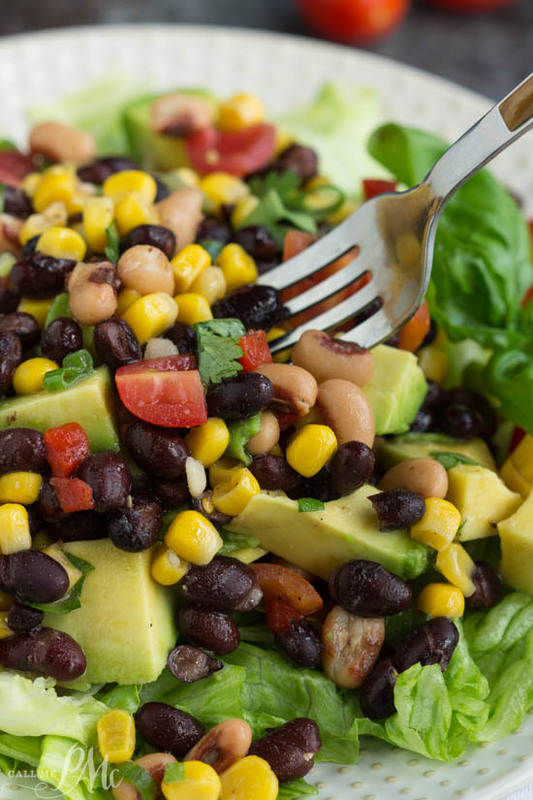 This light and vibrant Avocado Black Eyed Pea Salad is full of nutrients! 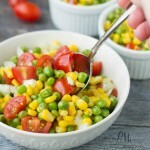 Fresh, flavorful, and filling this is also an easy and simple recipe to put together. I’m a little obsessed with these flavors after making this Black Eyed Peas Salsa. With the addition of a few ingredients and substituting a few other ingredients, I made the same flavors into a hearty salad. I added avocados and black beans to my classic Black Eyed Peas Salsa. You could also add a protein like chicken or shrimp that will make it a little more hearty. As well, I used fresh basil instead of cilantro. Then I used a white wine vinegar in the dressing. This makes a delicious side dish for a family meal or with the addition of chicken a filling stand-alone meal. The vinaigrette of sugar, vinegar, and oil gives the salad a slightly pickled flavor. If you prefer, you can leave off the vinaigrette dressing and use your favorite dressing. Sometimes I add ranch in addition to the vinaigrette. 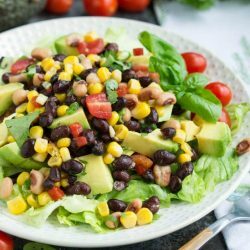 You then spoon the avocado and black bean mixture over a bed of lettuce. I used iceberg this time, but Romaine or any variety would be good. It’s a light and bright salad with bold Southern-style flavors. Another bonus, it can be made really quickly. Canned beans are ideal for this recipe; this also makes it very easy to make. And, very easy to always have the ingredients in your pantry. Coincidently, this makes it a great busy weeknight meal. Which is a huge bonus for me since he boys are back in school and have extra activities. This salad has a light, bright flavor profile. 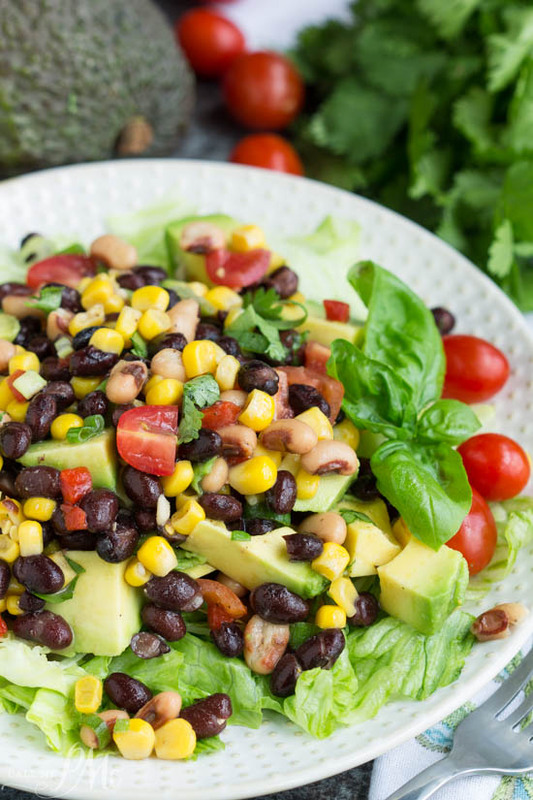 Avocado Black Eyed Pea Salad is a great summery salad with a variety of textures and flavors. I made a light vinaigrette dressing for it, but you can leave that off and substitute your favorite salad dressing. 1 tables fresh basil chopped. In a small saucepan, stir together vinegar, oil, and sugar. Heat until it boils then remove from stove and allow to cool. Drain peas, beans, and corn. Mix cooled sauce, peas, beans, corn, onions, tomatoes, avocados, basil, garlic, and pepper together. Taste and adjust seasonings and add salt if desired. So vibrant, so colourful ! Thank you so much ! When does the avocado come in to the salad? I corrected the recipe, so sorry. It goes in with everything is mixed together at the end.